REPRINTED FROM THE ROBERT McLAUGHLIN GALLERY WEBSITE. ALL RIGHTS RESERVED THE ROBERT McLAUGHLIN GALLERY. Where there once stood a series of thick burgundy-and-gold bound encyclopedias, there now stands a computer terminal. When in need of a spelling check, the once well-loved desktop dictionary is no longer the first turned to. While the impact of technology on the published book could not have been anticipated, the future impact is now being considered. Are we facing a paperless future? 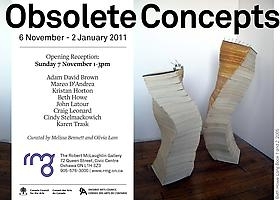 In the exhibition Obsolete Concepts, eight artists explore the question of relevance of the printed book. Guest curators Olivia Lam and Melissa Bennett bring together eight contemporary artists who challenge the need and role of books in the modern world. Through sculpture, audio, paper works, digital imagery and documentation of a conceptual art project, these artists each present a view on the existing form and content of books as well as the process of reading itself. In one work, artist Karen Trask takes apart a Petit Larousse French dictionary and carefully winds it into a ball of paper yarn. This is a labour-intensive craft-based process which painstakingly transforms the dictionary into an altogether different form. Not just deconstructing the dictionary, this piece reconstructs it to draw connections between the textile arts and the creative process of writing. It stands as a new beginning waiting to be unraveled.